Last week’s electoral victory for Kshama Sawant in Seattle has potentially made history for The United States and beyond. Kshama, an openly revolutionary militant, stood as a candidate for Socialist Alternative and won! The impact has been felt, on this side of the Atlantic, in the ongoing debate in Britain within the ranks of Left Unity. This organisation has grown out of 10,000 signatories to the appeal of film director Ken Loach for the creation of a new party to the left of Labour. Now at 1000 paid memberships LU is on countdown to a Founding Conference on 30 November in London. The supporters of the Socialist Platform of Left Unity– among them our comrades Kathrine Brannan and Henry Nowak ( see our article) have seen in Kshama’s victory a confirmation of their argument for ‘an openly socialist party’ and not just ‘a broad left party.’ The same debate is relevant right now in other countries, including France. Below, you will find our translation of an article from our Australian comrades of Red Flag which combines a lively report of Kshama Sawant’s campaign with an analysis of the reasons for its success and an appeal for unity of revolutionary organisations, too often in sectarian conflict with one another.The support given by the American comrades of ISO to the candidate of CIO is a positive example of a totally different strategy and attitude which we welcome in raising our glasses to the continuing success of Kshama Sawant and her comrades. 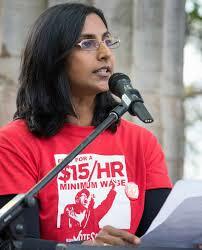 Kshama Sawant, an open socialist, won election to the Seattle city council in November’s ballot. One would have to go back to the first half of the twentieth century to find anything similar in the United States. Sawant, who was born in India, moved to the United States and is now a citizen. She first drew attention as part of the local Occupy protests in 2011. While Occupy has faded, many of those who were inspired by it have organised on other fronts. These include opposition to foreclosures, support to the strikes and demonstrations by fast food workers, and opposition to coal trains coming through the Seattle area. Sawant has been a vocal champion of these initiatives; activists from them formed the backbone of her campaign. A few days after her victory was confirmed, the new city council member stood with Boeing workers who were locked in struggle against the company. The employees, organised in the International Association of Machinists, had by a large majority voted down a concessionary contract. The Los Angeles Times reported: “The rain was cold, dripping down her blue poncho, but the newly elected city councilwoman’s words sizzled. Sawant’s campaign centred on three demands: raising the minimum wage to $15 an hour, instituting controls to curb skyrocketing rents, and taxing millionaires to fund a public transit system and other city projects. Such demands point in the opposite direction to the austerity pathway the Democrats and Republicans are charting. They struck a chord. So did her denunciation of the two major parties. The whole country has watched them fail to address the needs of the “99 percent”. Meanwhile, the “1 percent” has been coddled during the Great Recession and its aftermath. Sawant didn’t hide or downplay her socialist politics. The fact that she won on this basis in a citywide election is important. Recent polls show that 60 percent of 18-29 year olds favour socialism over capitalism. This should not be overstated. Neither Sawant’s victory nor these polls mean that socialism is well understood, or that large numbers now consider themselves socialists. Socialist organisations have been losing members, and the label is anathema to many, particularly in less progressive areas of the country. But it does show that socialists can make inroads when they have concrete proposals, and when there is an audience for socialist ideas. Seattle is a solid Democratic Party city. This meant that Sawant did not face the obstacle of “lesser evilism”, whereby people are cowed into voting Democratic lest a Republican would win. The race here was between a Socialist and a Democrat. Sawant’s campaign began modestly. She was able to utilise the fact that Seattle is a one-party town to point out that the Democrats serve the interests of the capitalists. “The Democratic Party machines … run these cities in the interests of the rich and powerful,” she said, adding that Conlin was a “corporate pandering politician”. As the campaign wore on, this became increasingly obvious. “Conlin garnered donations from every single corporate real estate interest, downtown law firm, commercial construction magnate, railroad honcho, and so on,” one commentator noted. Sawant rejected corporate donations. But as her campaign gained steam, her activist base raised a considerable sum of $125,000 (still less than Conlin spent). Conlin also had the support of the Seattle Times (the major newspaper), the Democratic Party district committees, several unions, the mainstream environmental organisations and the other elected officials. Sawant is an economics teacher at Seattle Community College. The American Federation of Teachers local endorsed her, as did a local of the Service Employees International Union (SEIU). She was also endorsed by the Stranger, a community newspaper that appeals to the young, the radical and LGBTI people. As her campaign’s momentum grew, there were interesting defections. Some Democratic officials broke ranks to support Sawant. Then the county labour council voted 28 to 21 to endorse the socialist. It wasn’t enough for a formal endorsement, but it made headlines. Then Conlin came over to support a $15 minimum wage, as did the two Democrats vying for mayor. Another factor in Sawant’s support was that Conlin was head of the city council’s land use committee, and had a pro-developer record. One activist wrote in a letter to the editor, “When ordinary citizens attended land use meetings in large numbers Conlin ignored our pleas” (to stop the developers riding roughshod over local people’s concerns). Sawant ran as the candidate of Socialist Alternative, an affiliate of the Committee for a Workers International based in Britain. The CWI considers itself Trotskyist. Her campaign was endorsed by Solidarity and the International Socialist Organization. It is to be hoped that similar efforts can bring together revolutionary socialists of different backgrounds in the United States in common work and discussion.